Nintendo has confirmed that a new model 3DS XL is on the way. The conveniently named New 3DS XL comes with near-field communication support for the moreishly collectable amiibo figures, as well as a dinky control nub on the right hand side of the console, for games that require two-stick support. This means that there will be some games that are exclusive to the New 3DS, including the upcoming Xenoblade Chronicles 3D. This remake of the classic Wii RPG is coming in April. Also announced, but compatible with both old and new 3DS consoles, is The Legend of Zelda: Majora's Mask 3D. This long awaited remastered version of the superb N64 title includes several improvements, including the addition of a fishing mini-game and rebalanced boss fights. If you pre-order Majora's Mask 3D here at GAME, you'll get an exclusive paperweight. The second major release to launch alongside the New 3DS XL will be epic monster-slaying role-player Monster Hunter 4 Ultimate. Fans of Monster Hunter will be able to buy the Limited Edition Monster Hunter 4 Ultimate 3DS XL exclusively at GAME, which includes Monster Hunter 4 Ultimate pre-installed on the console. 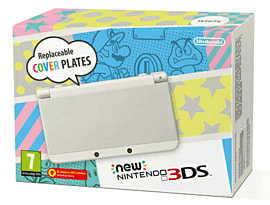 The New 3DS XL hits the UK on 13 February, with Majora's Mask 3D and Monster Hunter 4 Ultimate available from the same day.